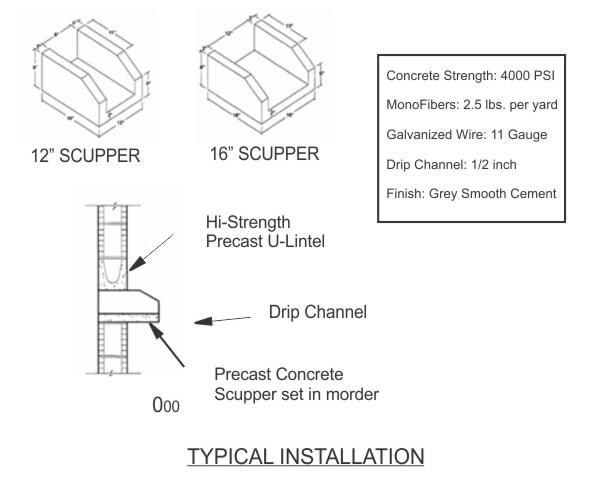 For your project in Boynton Beach, Precast Concrete Scuppers can provide solutions for rainwater management that are manufactured by Atlantic Coast Precast. Choose from premanufactured splash blocks, or customize one to your specification. This durable and affordable product is available to help prevent any moisture from damaging your property. By installing scuppers, you can provide additional protection by directing rainwater away from the building. Using your drawings, samples, or specifications, our experienced team at Atlantic Coast Precast has been creating custom concrete products for contractors, architects, engineers, and designers since 1965. In Boynton Beach, precast concrete scuppers are a durable way to protect your home or business. The process begins with a cast of your design, where molds allow flexibility to add or remove elements to change the size and shape quickly and easily. We believe in the products and services that we provide our clients, and whether it is for residential, commercial, or industrial projects in Boynton Beach, our precast concrete scuppers become stronger with age and offers protection for your building foundation landscaping. Our team has been providing precast products since 1965, taking into consideration rainfall intensity when sizing scuppers for projects, providing long lasting rainwater management.